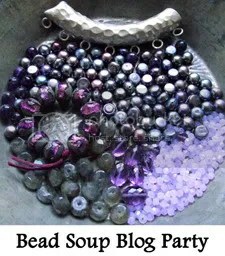 First off, if you’ve landed here as part of Lori Anderson’s amazing bead soup blog party, welcome! And, too, I love the wonderful selection of beads K sent along with her package. They are so akin to the size and style of bead I usually use, I knew from the start I would end up with something that felt familiar to me, yet new and different. Each of K’s beads is carefully represented in this necklace, but as I put together the final mix I also decided to use some leftovers and lessons learned from previous soups I’ve made. There’s a stunning tiger eye bead in there that’s from Sandi James, my very first bead soup partner. And see the glitter spiral disc bead that sits above the pendant? I’m reminded of the fantastic lampwork skills of my second Bead Soup challenge team, Stephanie and Chris Haussler, with that one. (All my beading partners have been so talented ~ I can’t wait to see how their soups turn out this time). The glitter disc is sandwiched between a couple of Swarovski crystals, and I think that little bit of sparkle hovering above the focal piece reminds me to think of the infinite ways one might choose to finish the sentence “I’ll believe” … it’s like fairy dust from a magic wand. I also added a couple of vintage grey, crackled acrylic beads into the mix. These were the very first beads I purchased on Etsy, and I love sneaking a few of them into very special creations. I’m also fond of the Celtic-looking spacer links. They were just a little something I picked up a few years ago at Michaels when I was shopping with my son. If this creation were to represent the different ways I might spend my life and contain special messages from the universe to my subconscious about who I might spend my time with, what would this necklace be trying to say to me? Oh. Wait. Am I the only one who gets so hung up with such symbolism? No, I’m pretty sure at least a few of my fellow soup makers will know exactly where I’m coming from. But enough with the metaphysical speculations, people, there are a lot of blogs left to see. Here without further ado is Lori’s link to all the participants if you need to be on your way (K and I are #95 on this list). But if you happen to have any leftovers from your soup fixings, take my advice and tuck them away for another bead challenge down the road. Your next batch is sure to taste even better if you do! ← Yes, there is life beyond beads …. You made a great couple with Kim! Lovely soup, totally fresh and beautiful piece! what a beautiful necklace, you did your bead soup proud! Love to hear the thought process behind the design. This is just stunning, and you totally rocked it! I really like the little dagger beads on the one side, and the metal filigree (?) pieces. This is such a great design. Oh Shea this is beautiful!!! I love turquoise and red or orange together and you really made the pendant pop – beautiful work! Very pretty – love all the design elements that your piece has…very unique! Really pretty, Shea! And you did get some awesome pieces from Kim! That is absolutely stunning!!!!! Love the mixed media focal!! Great job! Hi Shea, as per usual, perfectly wonderful work. I just adore how you used one of the beads that I sent you last round, that made my heart sing! I love how you highlighted that lovely focal. Great piece! Wow, the colors in your soup would have befuddled me, but you really did a great job pulling it all together. Well done! It’s lovely! Lovely focal, and your necklace certainly shows it off well. Great colors, great design, great necklace. what a wonderfully ecclectic necklace! Beautiful creations! Awesome job! I too love that pendant! That’s lovely! You did a WONDEFUL job, and I love the pendant! And thank you so much for allowing me to use your photo for the NEXT blog hop button! I hope you’ll join me on the next one — the badge and dates are on my blog! What a beautiful necklace with such a special message. Beautiful piece. The photos rock! And I loved reading the story of how it came to be. Very nice! I love those links. Such a gorgeous combination of colors and design…very well done! I love your necklace, badge and your way of showing it with the scrolling pictures.Gorgeous. Just beautiful, and I loved reading your narrative! What a neat focal! Beautiful work! Wonderful! You have created a terrific piece of wearable art. I like your use of color and texture. Thank you for sharing your artistic process along the way. Cheers! That I love your pieces goes without saying! But I am also captivating by your writing. I went from post to post – digging into your archives, laughing and learning! It is great. I like the assymetry of it. Your celtic links really work in this. The focal is delicious and you set it off ver well. The colors are so warm and inviting. Nice. It is a beautiful pendant. Great job! Beautiful design! I love the color scheme! Absolutely wonderful! Love the meaning behind each part… just wonderful! Artsy & Beautifully designed. And I like the slide show presentation. Soup-er job! What a lovely mix you cooked up there – and I love the fact that you included beads or references from past bead swaps. I’ll have to put my leftovers away and keep my fingers crossed that I get picked as one of the 200 in Lori’s next hop! I really like the beaded wire you used between chain links, really nice effect! I do believe you are funny and I do believe you cooked a fantastic job out of your soup! Love the story, thanks for sharing..
what a beautifully written entry and such a wonderful piece! I love it! Very pretty necklace! I like the mix of shapes and colours. Very well done! i love the stash you had to work with!!! and you did them justice—what a beautiful piece! Simply beautiful pieces! love your creativity! That focal is so pretty…and I love what you did with it. I enjoyed looking at all the views in the slideshow! Beautiful and the memories are so sweet. I love it. That’s some lovely soup and a beautiful necklace you’ve created! a Necklace holding memories from the past bead soups… that is such a romantica idea. Love it! Very fun and inspirational piece, love that you did a slideshow- my hand hurts from scrolling. Sorry to take so long to get to you. I am barely half way down the list!! Come baaaack! you haven’t blogged in so long! Are you ok?